Shortly before Christmas 2017 I wrote a piece reviewing City’s financial situation. Looking at past years accounts and predicting a less-than-rosy future. I recommend a re-read (along with the comments). This week the 2018 accounts were released. This report covers the financial year (FY) from July 1st 2017, to June 30th 2018. It’s been a particularly busy and complex period for Norwich. It covers sales dating back to Jonny Howson and Graham Dorrans, through to this summer’s deals for Josh Murphy and James Maddison. We saw the club bond inject £5 million into the accounts. Contracts have been renegotiated, while others were let go. So, what are the results and how did my predictions fare? Income, excluding transfers dropped from £75M to £61M (I predicted £62M). This drop was expected. Player and Staff costs dropped £1M from £55M to £54M (I predicted £47M). Non-Player and Staff costs rose from £35M to £38M (I predicted £30M). Total expenses increase from £91M to £92M. “Gain on disposal of players’ registration” is listed as £48M (I predicted £12M for transfers up-to Dec). The club reports £16M cash in hand. This profit comes entirely from player sales. Overall the sheer volume and value of players sold saved us last FY. What is surprising is that costs weren’t driven down as expected, or, in fact, at all. What does this all mean for the 2018/2019 season? The £61M in revenue last FY featured the final parachute payment. This FY, without player sales, revenue will be around £32M. A £30M decrease. Expenses, which I had predicted a dramatic reduction of, barely moved at £92M this FY. This is concerning because £32M revenue vs. £92M in expenses won’t work. I believe this is one reason Steve Stone is not at the club and our new COO is going to be penny counting. Some expenses are non-repeatable, such as the new pitch, but new expenses will appear, such as the academy renovations. The club states they have a £10M tax bill to pay on sales. Without aggressive cost savings and further player sales there remains a gap of £30-£50M this year (I had predicted £37M). I appreciate that’s a wide range, but we are without insight into the structure of payments for Maddison and other sales. Either way, it’s sizable. The club has stated they will be in a “cash-negative position” by Christmas. We just witnessed a transfer window worth around £40M and within four months of it closing, we’ll be in the red. Unfortunately, the books continue to paint a bleak picture. Being in debt at Christmas will increase the need to sell players, just as the team is coming together. Our owners are debt adverse and unwilling to invest, so I’d expect 2-3 good players to leave, just to keep us afloat until next summer. Expenses must be driven down, so, unfortunately, players like Klose will be candidates. But savings must go beyond player wages and deeper into the club. As for what this means for the bond, I’m unsure. What is clear is that that the funding hole left by the end of parachute payments remains. This time I’ll finish with this – We’re out of money and out of time, enjoy Klose and Lewis while you can. For transparency, below are my original predictions (est.) vs. the actuals. It appears my pessimistic predictions for cost savings were, in fact, optimistic. – Late last year during a presentation (perhaps the AGM), the club discussed how much money they were saving on wages since contracts ended that summer. My recollection may be wrong, but I thought it was 200-300k per week. It’s odd this isn’t reflected on the books, with staff wages remaining stagnant. – 23M of the operating costs was for amortization of ‘intangible fixed assets’. This may be an area that sees reduction, as it has been significantly lower in previous years (16M in 2017). Thanks for cheering me up. What a load of rubbish you talk. Just like your predictions. Most of them wrong or wide of the mark. After reading your article, does this mean, if things go as you claim, in 2 years time, NCFC will no longer exist as a football club. What a load of rubbish. OK So justify your rubbishing of the article. Where has he got the maths wrong? Well there seem to be two main questions. 1) why did the player and staff costs not decrease more? 2) What are the implications of the likely end December negative cash balance? This will also depend on how much it is likely to be. I think we are all under the understanding that no further sales are required this season, especially if we have a chance of at least reaching the playoffs by the new year. I think these are the issues that need clarifying now. I don’t think my predictions were ‘wide of the mark.. I stated we needed to sell Pritchard, Maddison, and others, and we did. I’d also point you to my revenue predictions that were practically spot-on. I was incorrect on the expense because I expected savings to materialize, savings that we were explicitly told about by the club, but there’s no sign of them in the accounts. For instance the staff wages we were told 100k’s per week was being saved. Consider that Maddison was injured on the final game of the season. If that injury had put off suitors, we could be in debt right now. I don’t think Norwich will disappear, there’s a long history of clubs that go into administration and continue on. Norwich functioned as a club with debts until we brought in McNally, afterall. I also think we have enough assets to sell for the next couple of windows. I’m saying, it’s really crap timing that we’ll be going into debt (in a very public fashion) exactly when the transfer window opens, just when the team is starting to play some nice football. Whilst I totally agree with you Robin, I and I’m sure many others would like to know what’s happened to the supposed savings of 100k’s per week from wages…….or will that only show once Naismith; Wildschut et al have finally departed?? The big crisis was this summer and its been weathered and there is no way that we will voluntarily sell anyone if we still in the hunt at Christmas (which seems nailed on). The assumption that there will be a black hole in the finances every year is frankly nonsense and has been fully debunked by Steve Stone. Yes, we have to be careful but the predicted cash deficit at the end of the year is hardly disastrous. I’ve run businesses for nearly 30 years and sometime you’re cash rich and other times on overdraft. Accounts are a snapshot of a business at a point in time and without a full understanding of how transfers actually work (in terms of money moving in and out) can lead to some dangerous guesswork. Does anybody really think that the Club would gamble away a chance at promotion in January when there is so much money at stake? If anyone goes it will be because they force the club’s hand like Pritchard did, and while its unlikely Webber will have targets lined up. I believe that far from offloading players, other than parasites like Oliveira, in January we will see the squad strengthened for a final push. I think there’s conflation here between cash flow, that is actual savings in wages (52 weeks @ £200+k), and the provision of £11+m for ‘onerous’ contracts ie Naismith and Wildschutt, hence no overall reduction in staff costs. I guess that if you’re looking at the accounts through rose coloured (or the opposite) glasses your view will be skewed accordingly. Seemingly aiming at stirring matters up the EDP focused on the £10m tax bill which has also been latched onto by other observers as if it’s a matter for concern, but at least part of this will have been the VAT on the sale of Maddison and Josh Murphy. That is additional monies received before the year end and paid out again in the new year which will not have impacted on turnover and ‘merely’ a movement in cash. Once again depends on your viewpoint. I’ve not had a chance to study the figures in any great detail yet, but we’ve also got some deferred income from those player sales which we won’t get to see in the next 12 months. 1) “fills the gaps with guesswork based on his own negative agenda……” – Of course my ‘negative agenda’ was actually more positive than the numbers we saw. I predicted higher levels of savings than was actually achieved by 15M quid. 2) “This ties in with Steve Stone’s comments a couple of months ago to the effect that much of the hard work had been done in balancing the books as a result of the summer sales” – We clearly didn’t balance the books. We had 16M in June, we’re due to be in debt in December. That’s not balanced. Expenses last year were 90M, our revenue this year will be 30M. That’s not balanced. Inevitably the numbers are what they are. Revenue has now dropped to the lowest level since PL took us to the Prem. Our expenses remain consistently too high. Our Sporting Director has said that without selling Maddison “they wouldn’t be stood here” and the situation had been ‘dire’. 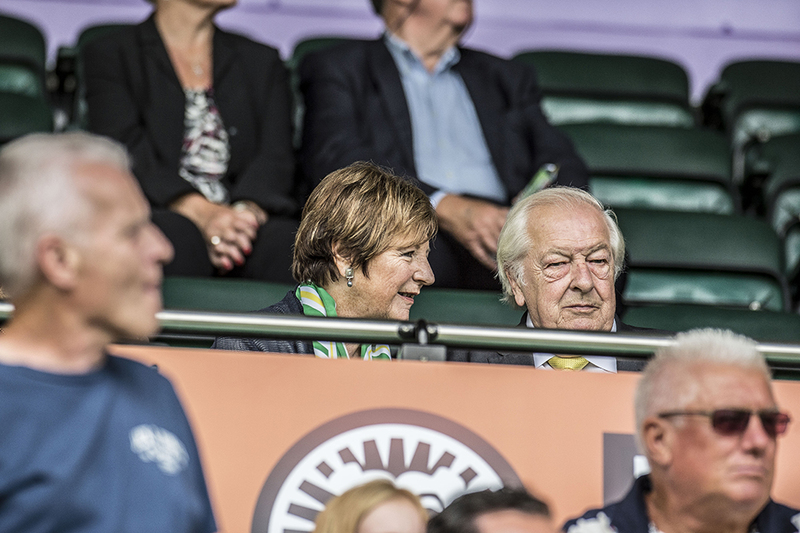 Our Chairman has said we’re due to be in a cash-negative situation by year end. When you look at all the sales from the last FY, how much money we generated from Howson, Jerome, Murphy, Pritchard, Maddison, Watkins, and Dorrans, Plus any addons for Jacob, the sale of Angus, and a 5M bond,. and yet we’re due to be in debt within 70 days. How do you come to the conclusion that the books are balanced? At the 2017 AGM the club said they were saving 173k a week in wages from player sales in the summer. That’s around 9M per year. Under point 7 in the report, the staff wages are listed as 55M for 2017 and 54M in 2018. A drop of just 1M (actually 900K). Can they confirm what happened to these savings? Hi Dave I’ve just heard the Binners have sacked Paul Hurst and dear old Lambo is in the frame to replace him. He might be on less money than me and I’ve been retired for some time, ha! My budget for work (print buying being the main expense) was slightly south of £200k pa and I had an excellent ally in a Glaswegian guy called Iain to help me achieve “value”. eg he would offer a figure for a service and say to the prospective provider take it or stuff it, we can always go somewhere else. Football club finance I cannot get my swede around. All I see just now is NCFC’s money leeching away but we’re doing so well on the pitch that I’m rather distracted just now. This is a a neutral and cautious analysis of be financial realities at NCFC and the predictions for future forced transfer sales will unfortunately prove true. The figures speak for themselves. No one does NCFC any favours by pretending otherwise. These are stark realities of a club reeling from ejection from the Premier League but currently enjoying a much needed upturn in fortunes on the pitch. Hopefully – we pray – the latter will continue and help solve the financial contradictions at the heart of the financial accounts. Having a little of the information is dangerous as assuming the rest can lead to the wrong conclusions. That’s fair, but the club said we’re due to be in debt by year end. They would simply not announce that if they felt the books were balanced and we’d return to profit in the new year. It does nothing to help them by positioning the club as broke going into a transfer window. Sky reporting Paul Lambert is in talks for the Ipshite job how the mighty have fallen. I wonder how many will still praise him for the job he did at city if he takes it even CJ said he would do that being an ex city player. Very interesting Dave. I wonder how we compare to other medium-sized clubs – I accept this would be near impossible to find out. Its rather depressing that a Club that’s been selling out home games foir the best part of 10 years can still be practically broke. Hmm. Clearly the finances are looking pretty tight, but one of the big unknowns, to fans anyway, is the timing of the transfer fees for Maddison et al which cld alter the position materially. Also, aren’t quite a few of the overhang contracts from our doomed attempt to stay in the PL due to expire in the Summer. The savings there, plus the sale – if we have buyers – of some fringe players shld help to bring the gap down. The finances are not in great shape but l’m not too despondent yet ! I think there are one or two points not quite right in your analysis. Staff costs of £54 million include a £12 million write down of contracts now considered “onerous”. Without that, the figure would have been £42 million, less than your forecast of £47 million. Total expenses of £92 million include, as you say, £23 million of amortisation of contracts. This cost will virtually disappear this year as the total book value is now only £14 million. I stick to my prediction of an operating loss (without any player trading) of between £15 million and £25 million for the current year. This may well be covered, in cash terms, by the proceeds of the recent sales. I can’t pretend that the financial outlook is rosy but I don’t think it is quite as black as you have painted it. Meanwhile, I intend to continue to enjoy the football we have been seeing in recent weeks! I was wondering why the staff costs had not come down more, so this £12 million write down seems to explain why the reduction in the accounts is only the £1 million less than last financial year. It has still not been said HOW MUCH the cash negative position by January is expected to be, but yes, there is still no indication that it is not believed to be manageable, given the summer player sales. The main unexpectedly large expense appears to be the £10 million tax bill. Well if that is £5 million over estimates, it’s still not creating a huge hole. And obviously the club’s main priority will be to ensure that DF is able to continue to push for promotion in the new year, without having his squad suffer any depletion or uncertainty. The headline wage bill, at £54m looks high, but this includes a wage cost of £12.2m for onerous contracts. It’s effectively a one-off (hopefully) charge, so the realistic wage is circa £32m pa – still high by Championship standards, but by a more reasonable indication of where the Club is likely to be for the forthcoming year. 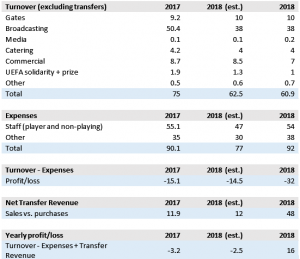 The operating expenses includes not only cash items of wages and other operating expenses, but also the non-cash item of player amortisation and impairment charges of almost £24m. This is how the total expenses in the P&L, of £92m are assessed. Critically, at YE, player debtors (money owed by other Clubs to NCFC for players already sold) was £42.3m. In contrast, player creditors (money owed by the Club to other Clubs for players already acquired) is just £14m. While you obviously have to add in the post YE sales and acquisitions, the position is no where near as desperate as suggested above. All that is rather superficial but, hopefully, answers some of the questions and concerns. How did you get 32M? 54-12 is 42M. 3) we need to pay for renovations of the academy (5M), some of this may have been paid out, of course. Businesses can run in debt, but let’s not try and minimize the fact that the club announced it will be in this situation when the window opens. They would not announce this if the books were balanced. It’s that simple. My mistake, of course I meant £42m. 1) debtors (note 17) clarifies that £22m of the £42m is due after a year, or more – by implication £20m is due this FY. Contrast player creditors due to be paid within one year at just £8.7m. 2) Corporation tax isn’t due now – it’s payable within nine months of the YE, so we have until the end of March 2019 to pay. 3) Assets in the course of construction is listed at £2.8m (note 14) at YE. 4) the bond isn’t repayable until 2023. Cash negative means they expect an overdraft by December 2018 – it doesn’t automatically imply further player sales, as I think you’re suggesting. This will, of course, be dependent on a number of factors, including subsequent receipts and payments on transfers already completed. So to your point 1 Gary. We have 20M due in this year for players. We have 8M due out for players. We have a 10M tax bill. We have also bought a few million worth of players. That’s almost equal. So the benefits of the players sold this summer is already accounted for. Taking us back to the wage and non wage costs being substantially higher than revenue. You’ve completely ignored the £16.1m cash in hand at YE. Yes, I fully appreciate that there’s likely to be an overdraft by December. And, yes again, there’s going to have to be further wage reductions -Stewart has already alluded how some of these will occur. Equally, the onerous contract provisions has accelerated the amortisation charge into last year’s accounts – a consequence being the charge will be significantly lower going forward, offering the cost reductions you’re so concerned about. Some important stuff here, both in the original piece and the comments. Dave (B) feels his usual need to accentuate the negative; the comments of Robin S, Mike C, John T and Gary Field are important to note for balance. That said, the accounts are a reminder of our financial fragility and the need for continuing vigilance. Clearly, progress has been made. It’ll be further helped by the ending of legacy PL contracts next summer (the only one we might want to renew, and hopefully on different terms, is Timm Klose). Because of some slightly unclear figures in the accounts (as discussed above), it’s actually hard to assess exactly how much progress, and what remains to do done. Both are probably substantial. In pure financial terms, of course, the progress would be greater if we hadn’t made significant player signings – in fact, around 20 since Stuart Webber took over. In a somewhat bizarre omission, Dave B fails to acknowledge that when talking about players we’ve sold. It’s an undeniable fact that planning will be easier now that we don’t have to start every summer by finding £20-30m to make up for falling income. It’s equally undeniable, as Dave says, that our present income is lower than for decade and there’s still work required to adjust to that lower cost base. So the accounts offer some grounds for encouragement, but no grounds whatsoever for complacency. Generally a fair and balanced comment. I will disagree on a couple of points. 1) Re: players bought. This summer the big transfers out were pre-June (30th), so in these accounts. The transfers in were post June 30th. Ed and Stuart echoed this point. This has given these reports a skew towards the positive and was a reason they mentioned that we’re cash-tight. 2) I don’t believe I accentuate the negative. Last year I said we needed to sell Pritchard, Maddison, and others. And we did. Despite many others saying this wasn’t the case and lambasting my ‘negativity’ (aka the facts). The club has confirmed the situation was ‘dire’ before the summer’s transfers. Dire, the clubs word, not mine. So I feel there’s some messenger shooting here. Yes costs have come down, yes we’ve made some good deals. But the goal is to be ‘self-funded’, that’s the ball-game. We aren’t there and IMHO, we’re not close. Continuing to blame the PL signings for all the club’s ills, while ignoring the fact that the PL assets and money have kept us afloat for the last two years, is a very lopsided view that many people prescribe to. The armbands are now off. If you look solely at players bought by Webber, then sold by Webber, there isn’t a lot of evidence that this approach works, yet. Dave: my point about players is that you always highlight what we’ve sold, without acknowledging equivalent incomings. Between 1 July 2017 and 30 June 2018 we made around 15 signings – 15! Despite your insinuations to the contrary, we’ve all consistently agreed that Maddison had to be sold. Pritchard forced a move. A good chunk of the money received for him – and more recently for Josh Murphy – went on acquiring new players or extending the contracts of others. At the fans’ event last night, a stark contrast was drawn between Norwich’s commitment to keeping & developing its young talent, while Ipswich simply cashed in on theirs. The other big contrast – fully acknowledged by the Ipswich contingent – was that Norwich seem to have a plan, while Ipswich don’t. It’s not all rosy, but it’s not all bleak either. I’m glad, by the way, to see you enjoying the football success that Stuart Webber’s dealings have facilitated! You repeatedly said selling one would be enough. We sold Pritchard, so by your logic we wouldn’t have needed to sell Maddison. Let alone Murphy and Jerome. Indeed. If you’ve followed the facts, Maddison had to be sold but Pritchard forced a move out. I fully agree that we wouldn’t have been able to sign 20 players without his sale – but that’s not what you ever claimed. The current wage situation is also likely to be far more positive than you suggest. The figures are for 17-18 and will therefore include large sums for Wes and over half a year’s wages for Alex Pritchard and Cameron Jerome. This year’s figures will not only be without these costs but also the wages of Madisonn and Josh M + also the loan deals for Reed and Gunn. The staff costs are also likely to include some of the restructuring that took place last year. After this year, we will be freed from the not inconsiderable burden of the wages of Russell Martin, Ivo Pinto, Naismith and Jarvis (and Wilshutt?) and probably Nelson. This must cost us iro £10m+ I would imagine from players who have contributed very little this season. We may even get the of transfer fee for one or two of them. Of course, there will be the costs of the new players recruited and loaned, but this is likely to be at a significantly lower price. The expected transfer surplus that should arrive this year should ease the transition and by the end of the year we should have completed the transition to self-funded status. I’m not saying that it will be a doodle, but do feel that your article did not take full account of some of the details behind the accounts. It’s possible that in reality we are a few million ahead of that 47M estimated for 2018. Expenses – Predicted 77, actual 80. That’s not bad for “rubbish predictions”. Those pesky onerous contracts. Inevitably I compared report to report. Am I right in saying that there are so many unknowns, players wages in the next financial year, money owed by other clubs to us/us owed to them and ” one off adjustments ” to make a really 100% certain where we will be next season ? I am a total layman in all of this, and maybe massively wrong but I do think a lot of people are sticking their head in the sand over this. Next year our income will drop massively with no ” parachute payments ” so unless a lot of net money is owed to us surely player costs and non player costs must be reduced almost by half ? is this realistic ? how have non player costs gone up by over 10% when we are supposedly cutting our cloth. As I say can someone explain this to me, I have no agenda, in fact I have been a long term supporter of Webber, Stone and Farke . But I think we will have to sell our best player at the end of every season and I think people trying to minimise this are doing a disservice to us the great city supporters. Best of not luck Agent Lambert ! The parachute payments finished at the end of last season, so our income won’t fall again next summer. Our income level, though, is now substantially lower than a couple of years ago. As Dave points out, our spend is still on the high side in relation to it, hence the need to continue controlling costs. But we’re no longer in a deepening hole. Tim, I don’t think the situation is anywhere near as bleak as David B suggests. As has been discussed the wage costs a many millions of pounds lower than they appear, due both to accounting provision made within the accounts and also to the fact that some expensive players have left us. We are also in a strong position with regards to our assets. Our current assets are 67 and a half million pounds, where as a current liabilities are about 46 million pounds. This means that we can meet any payments that fall due over the next financial year we 21 million pounds spare! Of course, a lot of this extra money will be needed to meet any shortfall in current revenue relative to current expenses. However with wages falling sharply, there is little evidence in these accounts that suggests we are in great financial difficulty. Of course, we will have to be careful but the evidence suggests that we have largely made the financial transition needed with the loss of parachute payments. When you say 47 million for 2018, do you mean the financial year 2017-18. If so,how did you arrive at this figure?